Can I remove the RealTimes watermark from the bottom right corner of my Stories? 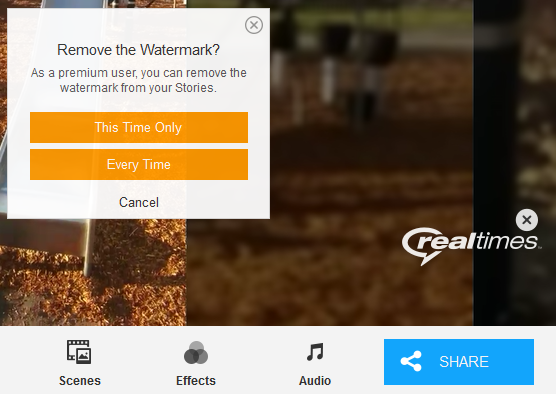 If you have a Premium or Unlimited subscription to RealTimes, you can remove the RealTimes watermark from individual Stories, or all Stories. When you are viewing your Story in the edit window, you should see an X just above the watermark. Click or tap on the X. You should then see a popup asking if you want to remove the watermark "This Time Only" or "Every Time". Click or tap on your selection. The watermark will disappear from the Story. Note: At the end of the Story, a black screen will appear that says "Made with RealTimes." This cannot be removed.